When you work with a product you know and love, it looks easy to achieve the highest of standards. Experience is something money cannot buy! As a family owned and run business with over 57 years in flooring in Sydney, we control the whole process of supply and installation. Our tradesmen are highly skilled. Builders and home owners in the past tended to overlook Solid Wooden Flooring, mainly because it is initially more expensive than other types of flooring; however there are many great benefits which outweigh the initial additional cost. Without a doubt timber floors is one of the healthiest options for flooring. Many people are lead to believe Bamboo is harder than a timber floor. Bamboo is technically a grass, not a tree that starts with rhizomes (stems that grow underground) and send shoots and leaves above ground not everything about bamboo is eco-friendly. A necessary process in manufacturing a Bamboo floor is called Urea, it is a type of formaldehyde used to finish many types of bamboo. Formaldehyde is a Volatile Organic Compound (VOC), which reduces indoor air quality. Bamboo floor planks are manufactured by slicing or shredding the stalk of the bamboo grass plant, and then adhering the pieces back together using heat, pressure, and a resin based adhesive. However if you do not use this process but rather heat the Bamboo you decrease the strength of the Bamboo, oftentimes making it less durable than regular wood. bamboo planks that are darker in colour are generally also softer. That is because the carbonisation process used to colour the wood also weakens it structurally. Formaldehyde is all around us in many objects of daily life. It’s in your clothes, furniture and curtains. Formaldehyde is now classified as a known carcinogen, or cancer-causing agent. The bottom line is that you do not have to have it “living and breathing” with you every day of your life. Solid Australian Hardwoods are not manufactured using Formaldehyde. Quality wooden floors last for decades – Unlike carpets which on average need replacing every 5 years, due to stains, holes, or shabbiness from everyday wear and tear. With a minimal amount of care and maintenance, Solid wooden floors actually develop character as the years go by. Timber floors are easier to clean than carpets. A static mop or vacuum (with bristles) keeps your wooden floors looking great. Or a wipe over with a damp mop will remove any dirt that has been brought in with ease. This would be a nightmare for Carpet owners. Timber flooring is more hygienic than carpets. There are horrifying reports explaining the parasites that carpets can hide. Allergen producing, dust mites, fleas or dust play havoc with Asthma and allergy sufferers, which a wooden floor eliminates. Carpets also trap in unpleasant odours from animals or things that have been spilt. In contrast a polished timber floor is a delight, odour free and will make your home more inviting. Wood is warm in winter and cool in summer underfoot. If after a few years your timber floor has been scratched or is a bit damaged due to heavy wear and tear. A simple sand and seal will bring it back to new again. This is a lot less costly than refitting a new carpet, floating or engineered floor. One of the most important advantages of a hardwood floor is the timeless appeal that timber has. Carpet, linoleum, tiles and colours definitely go in and out of fashion – think of what we had in the 70s, 80s and 90s. 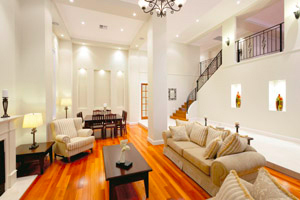 Timber floors’ appeal has lasted centuries and is more popular now than ever before. increase as a result of fitting a timber floor. Should you choose to go the extra yard and select an Australian hardwood you floor will appreciate in value and therefore is probably the only truly value adding product you can invest in. Most other fixtures and fittings depreciate with time and design trends. Take one of the better known species Brush Box, 20 years ago this was one of the most affordable species available today it is one of the most expensive, a definite selling point for any home owner with a Brush Box floor installed. Tiles although as hygienic and easy to maintain as wood, do not have the same warmth and feel that timber floors have, tiles do not have any “give” underfoot, unlike a timber floor, so you wont be so tired or have aching feet. A timber floor was always considered only available to the very wealthy, however, modern production methods supported by Australian Reforestation Programs mean our Australian Hardwood timbers for flooring are accessible to the vast majority nowadays. Can you give me a price on a solid timber floor? That is the question we get asked every day, numerous times. What is the bottom line? Well if only it was that simple, the fact is that hardwood flooring has an array of benefits over other types of flooring. So do you judge a floor by its price or how long it will last and how good it will look for the longest period of time? The answer should be I want the best value for money I can get for my Client or me as an owner. Australian hardwood flooring may cost a little more upfront, but in the long run is vastly more economical, as it will outlast and out perform other flooring products. Careful consideration is needed before you choose your flooring, as not only is this a big investment, but it affects your family’s health, the aesthetics and value of your home. Ask any owner of a timber floor and I think you will find that they will say it was the best decision they ever made! Matching your timber flooring and staircase require specialist carpentry and joinery skills which we offer. Don’t accept the inferior method of tongue and groove floorboards that will gap and become unsightly. 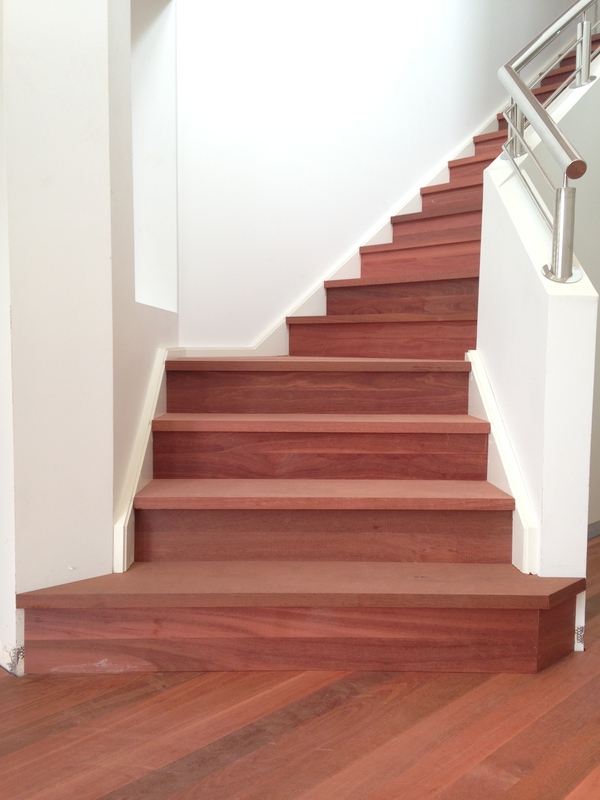 We provide complete supply and installation of solid treads with risers to existing staircases that can be matched to the timber floor installed by us. A Staircase finished in Australian hardwoods offers an unparalleled elegant appearance . Many Builders as a standard inclusion in their homes offer an MDF staircase as part of their Build. Commonly then covered with carpet. However an MDF staircase that is “wrapped” in solid treads and risers offers a significantly more stable and durable option to other finishes. Modern homes exude quality, style and elegance when a wooden staircase is installed. Add the wow factor and change the whole look of your home. 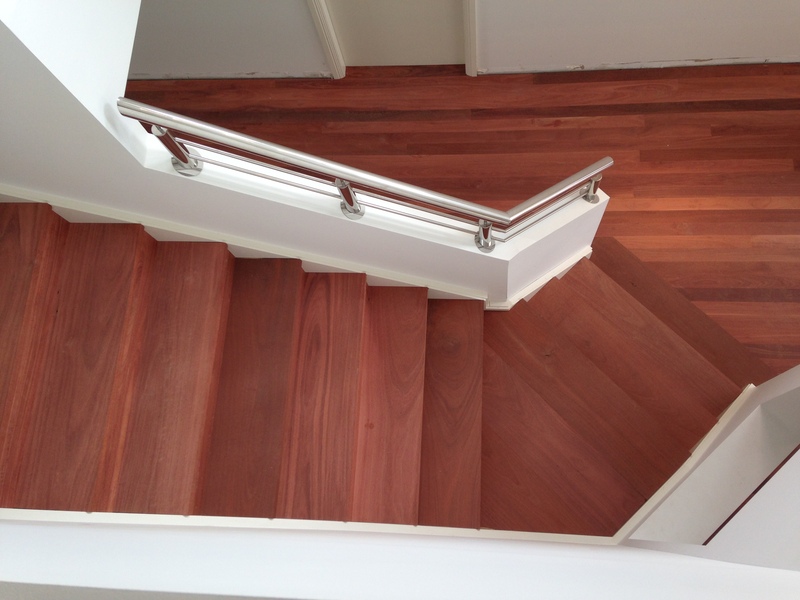 At Timber Floors Pty Ltd We are experienced working with solid Australian Hardwood Stair Treads. Your choice of wood and finish is key to a staircase renovation or a new Floating or cantilevered hardwood stair tread option. Our advice can help you choose the best-suited species for your houses location. Having a great staircase doesn’t always mean installing a new one from scratch. Our on-site renovations make having a new timber staircase possible and easy. The end result is a solid wooden staircase for a fraction of the cost. Each job is treated on its own merits. We have our own unique system(s) of installation for over existing formed concrete steps or existing MDF staircases. We can dress the existing staircases with solid treads and risers to completely transform old or new stairs into stunning Staircases. We also offer solid double treads fitted to existing or made to order steel mono-string open rise staircases. As well as floating or cantilevered hardwood tread options. We offer off the Plan or Site measure and Quotes. All quotes are written and are sent direct to you following your visit to our showroom where we take you through the whole process of supply and installation.